If you adopt only one new healthy habit this year, I hope it’s drinking green smoothies. Starting your day with a green smoothie is simply the easiest way to flood your body with nutrition and set your taste buds up for a healthy start. Plus, they take only minutes to prepare! This Blueberry Kale Smoothie, for example, can be ready in less than 5 minutes. If you want to adopt a second new habit this year, I hope you’ll replace your disposable straws with a reusable option, like these stainless steel straws. Did you know that even though plastic straws can be recycled, we throw out 500 million straws each day in the United States? That amount would fill 127 school buses! (And that’s just in one day.) To me, that’s shocking. That’s why I’ve teamed up with Mighty Nest again to help everyone get on the reusable straw bandwagon. 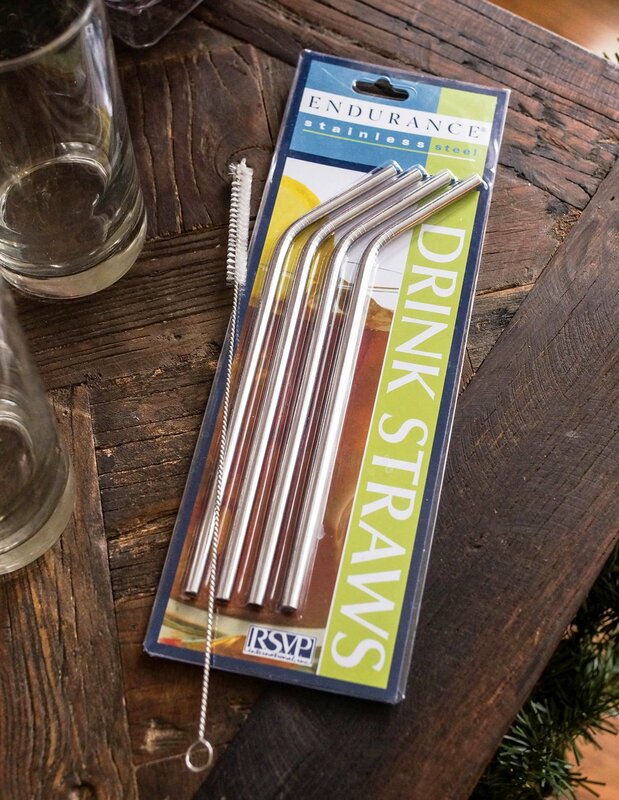 For just $1, you can get this set of 4 straws made of high quality stainless steel, which is durable, corrosion-resistant, and will not leach into foods. It also comes with a cleaning brush to give your straws a quick scrub before you throw them in the dishwasher. I’m pretty sure the first reusable straw I ever bought (nearly 6 years ago) was $10 per straw– so this is seriously an AMAZING deal. This special offer is available to my readers who sign up for the MightyFix for the first time. If you’re not familiar with the MightyFix, it’s a subscription service that sends you one non-toxic product each month to help you gradually make healthier upgrades in your home. For example, a set of wool dryer balls might replace disposable dryer sheets. A new glass water bottle might encourage you to ditch single-use plastic bottles forever. A set of Bee’s Wrap might finally replace the plastic wrap in your kitchen drawer. It’s an easy and affordable way to make subtle shifts, without doing anything drastic. And who doesn’t love getting a fun surprise in the mail each month? When you sign up for the Mighty Fix using the promo code DETOXSTRAWFIX, you’ll get these straws as your first Fix for just $1. After that, Mighty Nest will continue to send you a new non-toxic item each month. The service is $10 monthly, and the items are always worth more than that– with free shipping! There are no contracts, so you are welcome to cancel at any time. When you sign up using this link, the promo code will be automatically applied at checkout. 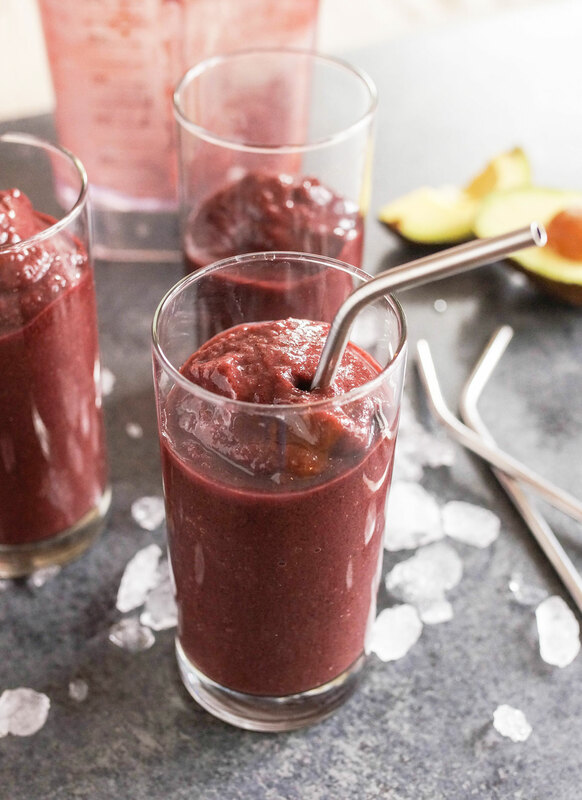 I hope you’ll enjoy your new stainless steel straws while you sip this Blueberry Kale Smoothie! A delicious way to eat more kale! 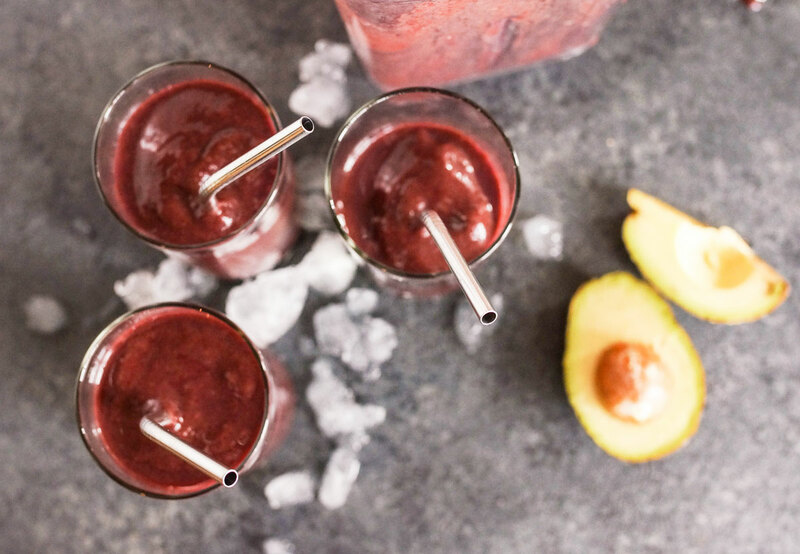 Combine the water, orange juice, mango, blueberries, avocado and kale in a high-speed blender and blend until smooth. If a thicker texture is desired, add in a handful of ice and blend again. Serve cold, with a straw. As always, feel free to make any modifications to this recipe as needed. When I don’t have orange juice on hand, I’ll use a freshly peeled orange in its place, and romaine or spinach can replace the kale in a pinch. Please leave a comment below letting us all know what has worked for you! Reader Feedback: Have you tried reusable straws in your home yet? I just noticed the Mighty Fix link, so no problem! Thanks for letting us know about these straws! How does one order these stainless straws? I don’t see a link for ordering. What if I just want to buy the straws? I have these! One in my purse, one in kitchen, and one in car. Do your part! I always try to get plenty of protein in he morning. What would be the best Wayne’s to increase the protein in this shake? Delicious! Normally I feel like blueberries steal the show when they are in a smoothie, but they don’t here :). I substituted peaches for the mango, and clementines for the orange juice. The avocado makes it smooth but not too smooth, and I can’t taste the kale at all. Perfect! I love this idea, but are monthly items returnable if we already have such products? For instance, one of the items you mentioned were the woolen dryer balls, which we already use. If that happens in the future, can we substitute for a different item? I would love to try this but I don’t use straws. Could I get something different? I ended up here because of an ad that was in my feed today for the straws. I took a screen shot but it doesn’t look like I can attach it. It specifically says the offer is good today and then also lists your webpage. However, when I put the code in, I get a message that says it is invalid. As I read previous comments here, I see that this was a problem in February that they did correct for you. Unfortunately, they are still running the ad as an active offer and the code does not work. I have actually been following your work and have one of your cookbooks. I’m sure that you didn’t know this would be an issue before you partnered with them. I like the products they are advertising in general, but what comes across as bait-and-switch or false advertising is a real turn off. I don’t take it as a reflection on you, but could you get it fixed again? Thanks and keep up the great work on your end. I love what you do. I don’t think they meant for the offer to expire, so I will check with them and make sure it gets fixed. Thanks for letting me know! I signed up and just got my first order of mightynest but they did not send the straws, they sent the beeswax wrap (which I do love). What went wrong? 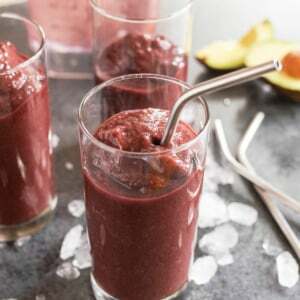 I like to have a smoothie in the evening with my daughter and the metal straws would be great, we waste a lot of plastic straws! Cindi– did you use the promo code DETOXSTRAWFIX when you signed up? I will contact Mighty Nest for you. I understand that this special is for January only, but this post showed up in my FB Newsfeed for the first time today. I was about to click on the link to subscribe, but then saw the deadline – is there a new special for February or can this one be extended since it is still displaying in FB Newsfeed as a current promotion? Where are the straws made? It took me a while to find it, but I believe they are made in China. I’ve got spinach and half of a banana. No kale or orange juice. Will that work in a pinch? Love this plan! I’m on board! When I modify a smoothie recipe, I just taste as I go. Perhaps a squeeze of lemon juice would be nice if you don’t have OJ? Fell off the food bandwagon this December and am ready to start eating healthier in January. I know I’m 6th months prego, but I’ve definitely gained too much!!! I am confused! The kale smoothie only has one leaf??? 1 kale leaf can be anywhere from 1/2 to 1 cup if you were to actually shove it into a measuring cup, and adding any more than that might turn people off from drinking it in a smoothie, since the flavor can be VERY strong. As always, you’re welcome to use more, but I didn’t want to scare anyone off from the taste! Thanks so much – I had never heard of Might Nest before. Totally just signed up! Would love to take advantage of the Mighty fix offer but am in the uk!